I know, you are probably thinking, “What?!? !” but trust me, this combination of two activities really played out nicely and happened to work in both Spanish 2H and Spanish 3 on the same day. In Spanish 2H, we were reading one of the Blaine Ray novels (El viaje de su vida) and in Spanish 3, we were reading an article about the Moors in Spain. 1st, we went into one of my school’s furnished collaboration spaces. Students were allowed to create groups of their own choosing; however, in each class (based on size) I limited group sizes. For example, in my classes of 32-34, I said groups could have no more than 5 students but also no less than 4. 2nd, the groups read a specific section of the text and took notes over pertinent information, including listing out new words they figured out from said text. 3rd, one representative stayed at the table and everyone else shifted over a table. The representatives shared the information they learned while the new people took notes. Then the visiting group shared what they learned. Throughout this part of the activity, students shifted tables 5 more times and learned about all sections of the text. Representative stayed put and learned as the groups cycled through their table. This is a useful alternative if the traditional jigsaw is too complicated. I like to mix things up, so I plan to still use both methods. Soon I am going to do a true World Cafe activity. More on that later :). Friday and Saturday I attended the Texas Foreign Language Association conference in Frisco, TX and had the opportunity to rub shoulders with some absolutely fabulous educators including Clarissa Adams, Amy Lenord and Noah Geisel. I also got to meet a #Langchat friend, Amber Hawk. I often take opportunities for optional professional development because I love to learn, but recently, I have felt that other than those offered by my coordinator, there hasn’t been a whole lot that has helped me grow as an educator recently. I began to wonder if I was becoming someone who thinks I know everything and thinks I have nothing more to learn. I had been doing a lot of self-reflection when TFLA rolled around. I was so excited to attend and learn some new ideas to incorporate in my classroom. I’m a life learner and a perpetual optimist so I had no doubt I would get at least something out of each session I attended–this was a weekend dedicated to world language teachers after all so it had to be a winner. I went to 4 sessions on Friday and left feeling more or less disappointed. Don’t get me wrong, I heard about some cool ideas and some interesting brain research information, but overall, I did not get as much out of the day as I had hoped. Maybe I was becoming someone who thought I knew it all already… I spoke with some other Plano ISD colleagues, and it seemed to be a general consensus that there was not a whole lot offered that helped us grow. And then the light bulb went off. It’s not that we aren’t just as eager to learn, it’s not that I think I know everything. The reality is, we have come so far with our curriculum development and professional development in the last 9 years that we are ahead of the majority of other world language programs. So now what? We need to pay if forward. Others are going to catch up with us and will be hungry for more like I am now. It’s now our responsibility to share the wealth of knowledge and experience we have to help others continue to grow and catch up. I met so many people who want what we have in Plano ISD. We have a performance-based curriculum that is based on the ACTFL Proficiency Guidelines. We focus on communication, not grammar. We grade on rubrics and assess with real-world tasks. We teach in the target language from day 1 and witness our students in level 1 able to converse for 5+ minutes and write 100 words using transition, sequencing and flavoring words after 1 semester. We are constantly reflecting, rewriting, and evolving. Every teacher has a drop down Steven’s Learning language lab system in our classrooms. We have a coordinator who works everyday to make sure everyone knows that world languages are relevant. We have had amazing opportunities for professional development. And now, we need to share. So I am submitting a proposal to SWCOLT about getting on-level students to willingly participate in communicative activities through the use of various techniques including AVID strategies. Or something to that effect. I also plan to present with Shelli Brown on activities that support brain research. On day 2 of TFLA, I went to 3 wonderful sessions that did not disappoint and reenergized me for the rest of the semester. I enjoyed what I was able to learn at this conference and was quite participatory in the twitter conversation. So much that I won a free conference t-shirt on Friday. Check out the great collegial conversation #TFLA13. I have been grading like a banshee this past week, trying to get all of my 2H interpersonal speaking exams graded before my level 3 students take theirs tomorrow. What became abundantly clear through norming and my hours of grading is that these students do not understand how to disect a prompt. They completely ignored multiple aspects that to the teacher appeared to be explicitly laid out in bullet form. Out of 87 honors students, only 8 completed the entire task requirements. 8!!!! Recognizing a problem and an accidental teacher failure, today I decided to experiment with my level 3 students. We began class by doing a partner speaking practice. I put the prompt on the screen, gave them 2 minutes to think, and then off they went. I recorded them on the lab for 5 minutes. After 5 minutes I stopped them and handed out a sheet with a checklist version of the same prompt. I then had them listen to their recording in order to check off the components they completed. Guess what. The majority admitted to not completing all aspects of the task–many barely completed half of what the prompt required. Guess what else. Only 4 students said a teacher had ever taught them how to disect a prompt. Can you guess what we did next? That’s right, I put another practice prompt up and had them take it apart and reword it into a checklist. Then we did the practice. The students were much more successful the second time around. So why hasn’t this been an issue before? Sure, I’ve had students not complete all aspects of a task, but never to such an overwhelming degree. Why is that? Well, the answer is simple, our students are requiring more rigor, and we are delivering, but we unintentionally have not properly helped them figure out what tools they need to use to be successful. We’ve given them tools, they just didn’t realize which ones were necessary. Credit: I did learn how to break down an English prompt at the AVID Summer Institute and intended to create a lesson before our first assessment. Oops! Wish I hadn’t forgotten until now! This past week was a whirlwind, but I was thankfully able to leave school Friday night at 7:15pm without returning at all this weekend. I am so excited for this school year to begin. I cannot wait to meet my new students and to teach a level I’ve never taught before–Spanish 2 Honors. I have taught Spanish 1, 2 and 3 on level, but never have I ever taught 2H. I hear I’m going to love it :). I am beginning this year differently than I normally do. I plan to spend an entire week on setting the tone. Each day we will do an icebreaker (thank you AVID Summer Institute for the many ideas) and a team-building activity. Together, we will explore what is collaboration and what it’s not (thank you Rebecca Gould) and establish norms–though, I do have veto power. We are going to have fun together everyday, and of course I will share how the week goes. 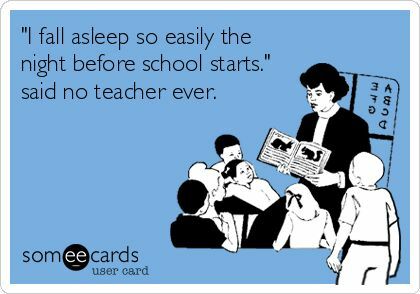 Good luck sleeping tonight, fellow teachers! Cheers to the start of another new year! Well, I arrived at school today to read the extensive notes from the substitute. This has been a bit of a stressful week, so seeing it all written up was the straw that broke this camel’s back and I burst into tears. Thankfully, I did not have on any eye make-up :). Originally, I planned to use the reflection in each class, but I ended up only using it in 1st, 2nd and 4th period because those classes were the ones that got bad reports. The other 3 classes got a decent report. The reflection went over well and opened up good conversations with my classes. I learned quickly what part I played in this situation and how we all can do things differently next time. A note about my teaching style: I have a relaxed style with my students and am aware of the differing learning styles and needs of my individual students. My students are used to working in pairs/groups as they complete assignments and use their phones to look up unknown words. Unless otherwise stated, please allow them to work together and talk as long as they are on task. They may use their phones to assist with their assignment as long as they are not texting or playing games. They may also listen to music with headphones as long as they are on task. If it interferes with their ability to work, the privilege may be revoked based on your judgement. I read this addendum to each class and got their input and approval (it was tweaked throughout the day). Next, in each class–even the ones not required to reflect–I clearly redefined and clarified my expectations for when there’s a sub. I then opened up a conversation about coping with people who are not like their normal teachers–going beyond just my classroom but how to handle a sub in any class. This included quoting from the AVID syllabus (by our awesome AVID department chair, Clarissa Moreno) about how to cope when a student feels threatened–count to 10 silently, take a deep breath and write your teacher a note about the situation to give to her when she returns. I explained that I know them, I trust them. I would believe them if they did that. BUT, I explained that when we act inappropriately or rudely, we automatically lose our argument even if our initial feelings were valid to begin with. While it’s never fun to have to deal with these types of issues, they happen from time to time, and I appreciate the learning opportunity that comes with every challenge I meet in life. I made sure that today was a learning moment for all of my students and myself. True, I will be a little nervous the next time I have a sub, but I know my students will want to impress me by doing the right thing. And they are not a bad group, they just had a bad day. Fridays should be fun. On Fridays, when I see what I have planned, if it’s not fun, I feel especially inspired to change it and make it better. Yesterday, I was planning for us to discuss the advantages and disadvantages of different jobs, followed by a timed writing. It was a lovely worksheet, one that I excitedly and proudly created during our summer curriculum writing in June. Well, while the purpose and intention are in the right place, I just knew I could make it better. And inspiration struck! Naturally, it struck at about 8:30 while I was dealing with 2 detention kids, with 30 minutes left until my 1st period class began. Isn’t that how it always happens? Well, I wasn’t going to let something like time get in the way of turning an okay activity into something awesome!!!! I ran around like crazy, managed to reserve the collaboration space, winged the instructions in first period–the experimental class–and managed to pull it off, working out a few kinks along the way. So what was this genius idea? Well, rather than do it as a worksheet, I divided the students into groups, assigning each group the task to come up with either the advantages or the disadvantages to a specific job. After discovering that 15 minutes messed up the flow of the other two parts of the activity, I shortened it to 10 minutes in 3rd period. True, some groups had difficulty compiling an extensive list of 10 advantages or disadvantages in that amount of time, but most had at least 6-7. After the 10 minutes, the students moved to one of my school’s collaboration spaces to hang up their posters. We then had a gallery walk (something I learned about at the AVID Summer Institute). They quietly walked from poster to poster, reading the information provided. The students could add to the posters if they had a good idea and were required to write down the top 2-3 advantages and disadvantages of the jobs they would consider for themselves. I allowed 15 minutes for this process. We then returned to our classroom and had our 15-minute timed writing (that we will peer edit on Monday). Sure, the original plan would have taken maybe a total of 25 minutes, leaving time for other activities, but would it have been as meaningful? Would we have gone into as much depth? Would it have been as personal? Would it have been as fun? No. I was so impressed with how many useful words and phrases my students figured out were important just by trying to come up with the advantages and disadvantages to 8 different jobs. We often feel overwhelmed by the breadth of what we or the students must do. Yesterday was all about the depth, and I’ve never seen my students dig that deep into this topic in 5 years of teaching it. It was AMAZING. And… It was fun :). I am trying to think outside the box with partner work this school year. I have a FABULOUS language lab in my classroom that my students feel I overuse. While I will never give up opportunities to use the amazing tool, I have decided to mix it up from time to time and get students up and moving (and picking their own partners). Today, my students completed an independent activity about their summer. Normally, I would pair them on the lab and have them ask and answer questions with each other. Then, I would mix up the partners a few times so they got an opportunity to learn about other people. When sharing activities like this, I try to spend as much time as it took them to do it so they see that it was in fact worth their time. Today, I decided to utilize that collaboration space around the corner by playing Musical Partners. That is my name for the activity that I stole from an icebreaker at the AVID Summer Institute. We went into the space (with their worksheet), and I played music on my iPad. While the music played, students walked around and/0r danced around. When the music stopped, they paired up, asked questions of each other and shared information related to the activity. I gave them about 2-3 minutes to speak before starting up the music again. They walked/danced until the music stopped and found a new partner. We did this 3 or 4 times (depending on the class) before returning to our room. It was a lot of fun :). In case you were wondering, my song choice was Shakira’s Estoy Aquí, a classic from when I was in Spanish 2 oh so long ago :).